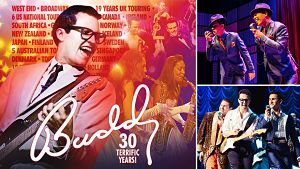 Buddy - The Buddy Holly Story is set to celebrate its 30th anniversary next year by kicking off a new tour at the Theatre Royal Plymouth which was where it first opened in 1989 before transferring to the West End and running there for over 14 years at the Victoria Palace, Strand and Duchess Theatres. The Plymouth run will also see the show being performed on Buddy Holly's birthday (September 7th), allowing the cast and crew to pay homage to the man who inspired the smash hit success. Tickets go on sale 8th June. Casting and tour dates for the production to follow.